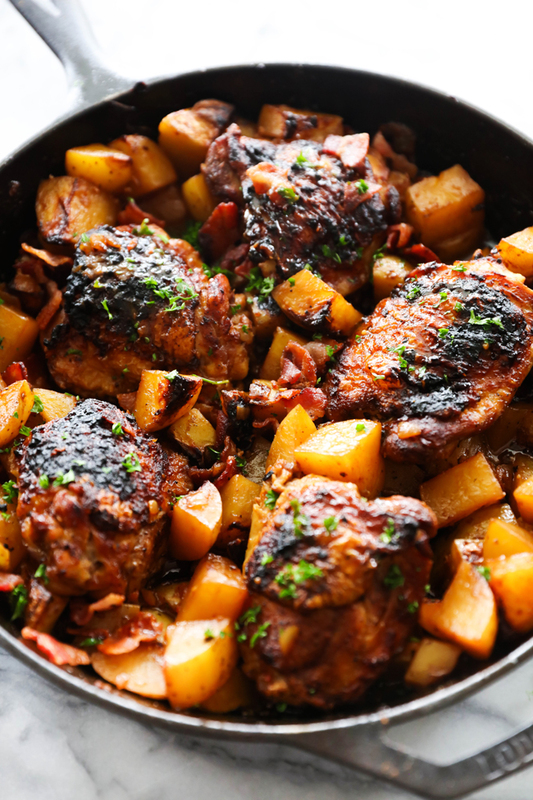 This Braised Dijon Chicken and Potatoes is a one skillet meal loaded with flavor. It is a delicious recipe compiled of caramelized onions, crispy bacon, roasted potatoes and juicy seared and baked chicken. This will be one unforgettable all-in-one meal you will want to make time and time again! 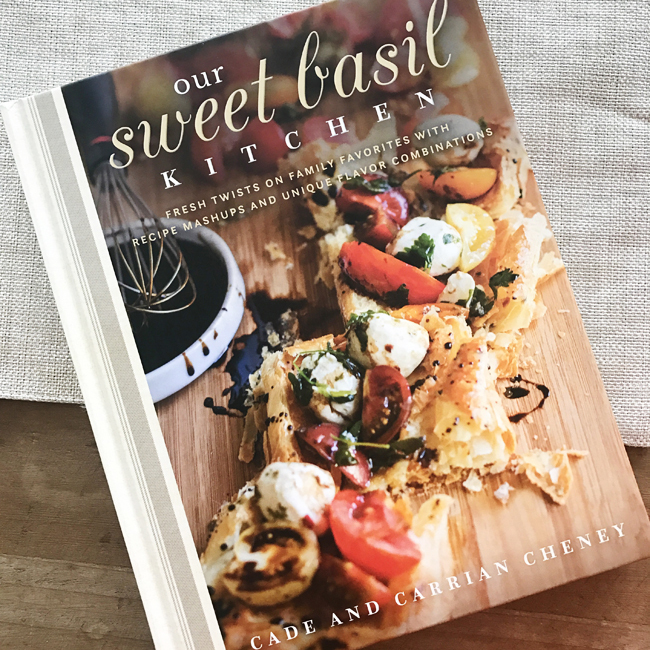 I am SO excited today to be sharing a recipe from my cute friend Carrian’s brand new cookbook, “Our Sweet Basil Kitchen.” Carrian and her husband, Cade, are an amazing blog team and blog over at Oh, Sweet Basil. I have always admired their hard work, delicious recipes and beautiful photography, so its no surprise that this cookbook has become my new favorite! Seriously, I am not joking when I bookmarked way too many recipes to count when browsing this book for the first time. This particular recipe, however, caught my eye because for a few reasons. I love skillet recipes. Especially skillet chicken recipes. Her picture was absolutely mouthwatering. It was an all-in-one meal. The veggie side was part of the recipe! WIN! As I got to cooking, I also came to discover and love that it was all done in the same pan! That is one reason I love cast iron skillets… They work on both stove-top and oven and can be easily transferred. The smell that filled the house was out of this world! Everyone who entered my home that day raved about how delicious it smelt. Once they tasted it, they could not get over how flavorful the entire dish was, how well it paired all the flavors and ingredients and how tender the chicken was. This was definitely a winning recipe at our house and will be on the regular rotation. Carrian and her husband Cade are culinary geniuses and this recipe is nothing short of their sensation work. Be sure and get your hand on a copy of their “Our Sweet Basil Kitchen” cookbook. They have everything from breakfast, dinner, side dishes, desserts and everything in between. I know it will be one of my most used cookbooks at my house. 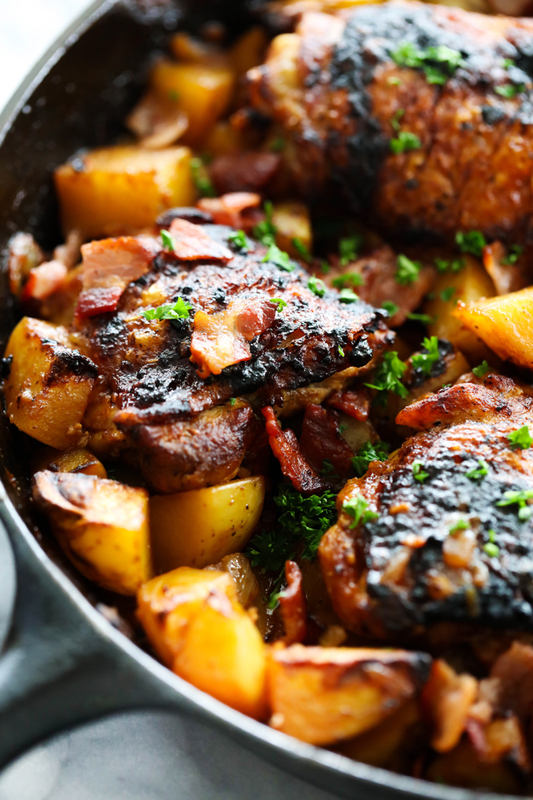 This Braised Dijon Chicken and Potatoes is a one skillet meal loaded with flavor. 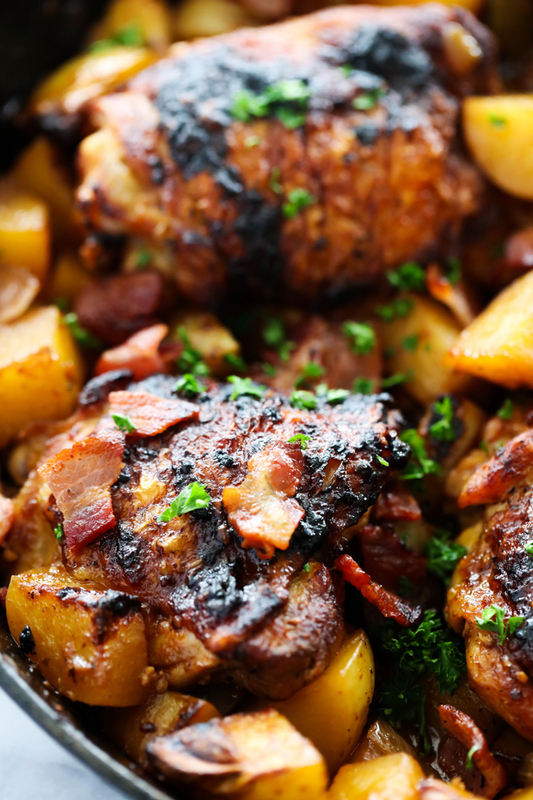 It is a delicious recipe compiled of caramelized onions, crispy bacon, roasted potatoes and juicy chicken. This will be one unforgettable all-in-one meal you will want to make time and time again! In a small bowl, combine vinegar, mustard, garlic, sugar and smoked paprika. Whisk together until well combined and set aside. Evenly season the chicken thighs with the salt and pepper and set aside. In a large heavy cast-iron skillet, cook bacon until evenly crisp. Remove from pan and place on a paper-towel lined plate. Remove all but 1 Tablespoon of grease. Heat grease to medium-high heat and then add chicken thighs, skin-side down. After chicken has been added, reduce heat to medium-low and cook for 3 to 5 minutes until skin becomes golden brown in color. No need to get it too dark as it will darken immensely in the oven. Once golden in color, flip chicken over and cook the other side for 5 additional minutes. Remove chicken from pan, plate and set aside. Increase heat to medium and add the 2 Tablespoons of butter to the skillet and melt. Add chopped onion and sauté for 3 minutes. After 3 minutes, add the chopped potatoes and continue to sauté for 4 to 5 additional minutes. Remove skillet from heat and add chicken and any juices that may have collected on the plate back to the skillet, skin side up, moving around potatoes as needed to fit them in. Add in the vinegar mixture from earlier as well as the broth to the skillet. Simmer for 1 minute. Transfer the skillet to oven and bake at 450 degrees F for 35 to 40 minutes. Checking for doneness at 35 minutes so as not to overcook. Don't worry about how watery the vinegar-broth mixture looks, it will thicken up as it cooks. While the meal is cooking, chop the bacon. Once chicken is cooked through, remove from oven and stir around potatoes and drizzle the sauce over the tops of chicken. Sprinkle with the chopped bacon and garnish with chopped parsley. If using boneless, skinless chicken breasts or thighs, reduce baking time down to 15 to 20 minutes. You can find the “Our Sweet Basil Kitchen” cookbook right here. That looks scrumptious! I can't wait to try it. I made this tonight for dinner. It was insanely good. We just loved it. Keep wonderful recipes like these coming! Okay, I have to try this recipe! I fixed this for supper tonight and it was delicious! Hubby and I both loved it, thank you for coming up with this recipe...it was fun to fix something new for a change. Sounds yummy. You say if using boneless/skinless chicken reduce time. Do I still brown the chicken (no skin)? Thanks!